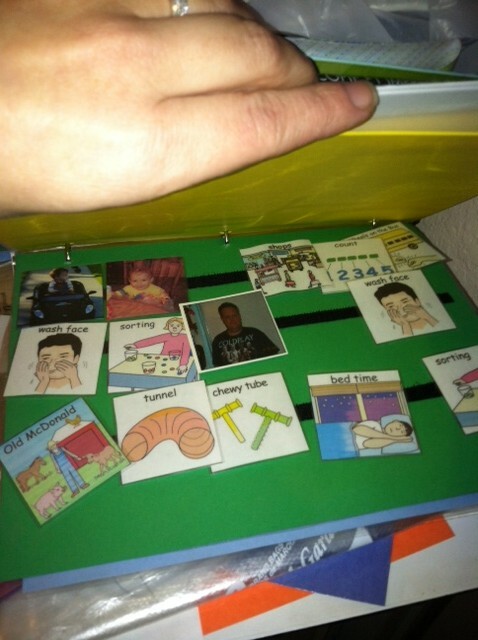 When my son was diagnosed with autism, one of the first things we did was introduce visual aids in our home. This included a schedule for his daily activities and many helpful graphics throughout our home. Since he was nonverbal and didn’t gesture at the time, the use of these aids helped to stimulate communication in a manner he more easily understood. We have little bits of Velcro throughout our home and relied on this heavily in the early days of our journey. Here are some tips and explanations to help you develop your own visuals for communication. The buzzword in Autismville is PECS, which is an acronym for Picture Exchange Communication System. There are tons of companies that provide solutions in the form of software, icon cards/boards, etc. 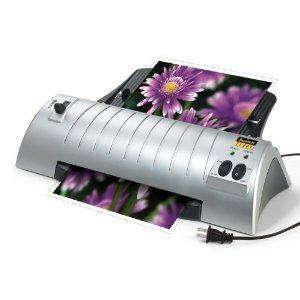 This is totally adaptable for DIY projects and only takes a pc with web access, color printer, laminator, and lots of Velcro. We use the Scotch TL901 and love it. The pouches are reasonably priced and the laminator runs around $30. This model does not require the use of a pesky folder when running plastic sheets through – making it much easier to operate. Ok, so how can you even know which style will be best? There are a couple tricks you can try, but if you’re working with a nonverbal, non-gesturing toddler you will need good detective skills mingled with a touch of ESP. My advice would be to try the colorful icons first and gradually introduce photos as you go. We only used photos to represent icons of people in the beginning. You can buy CD’s online with popular icons, download from subscription based sites, or troll Google for free images to download. I started with a 2010 version of this CD purchased from Amazon.com, but now just get the bits and pieces online and subscribe to Do2learn.com for the majority of our needs. Before you introduce this system in your home take some time to plan out how to make this flow with your life. For example, I always preferred wearing clothes with pockets and these were always filled with the most important icons (such as snack, drink, diaper change, etc). Each icon is typically printed as a 2” x 2” square. I print an entire page, cut them out, laminate for durability, then place a small piece of loop Velcro on the backside. You’ll end up with tons of icons, so you might want to create a binder to keep track of them in. I just laminate an 8.5” x 11” sheet and place three strips of Velcro running across the page horizontally. Hole punch it and voila, you’ve got a place to store all those little bits and pieces. You can make as many pages like this as you like. Other people get a poster board laminated and do the same thing to store all their PECS. However, I advise some caution here in the placement because most children can’t resist pulling these colorful pictures off if they can reach it. Trust me, it can become a confusing mess really quick. To set this up, start by creating a schedule board. This doesn’t have to be fancy, it can simply be an 8.5” x 11” paper that’s laminated with a strip of Velcro (Just the hook part of the Velcro). Put an outline of a rectangle at the top of the page to represent the “current” activity. Start very small – perhaps only noting 3-4 things at a time on the schedule board. Here’s a glimpse of my son’s visual schedule today. 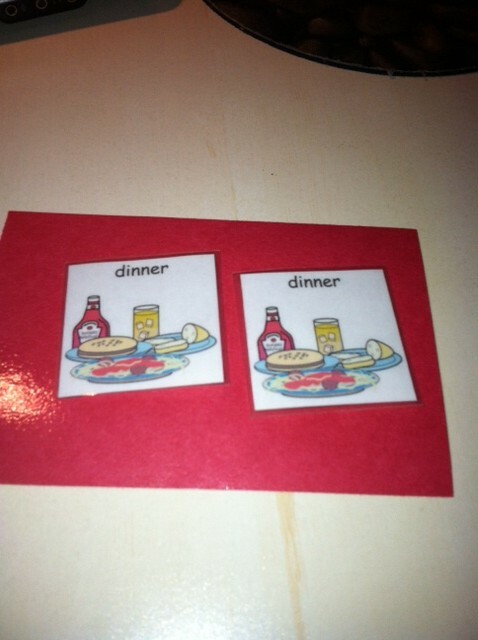 You’ll also need to make several smaller (index card sized) matching cards with two small bits of hook Velcro attached. We did this and placed some in key areas of our home right away. These places included next to our front door, on the changing table where I kept diapers, in the bathroom, in the kitchen (on the fridge), in the living room (our Play Area) on my son’s little table, etc. This is a small sheet that we use to match pics for various activities on his schedule. The idea is to teach your child that they can request the things they need or want through the use of PECS. This initiates the beginning of communication. It may take a little time before they catch on, but it’s such a help when this clicks! So, you’ll need at least two of each icon for the major daily events, foods, toys, etc. You’ll start by putting a schedule together first thing in the morning and you’ll use this throughout the day. We had to walk our son through it for a while in the beginning. I would start our morning by saying, “Wyatt let’s check your schedule.” Then I would gently walk him to his schedule (sometimes I’d have to carry him to it kicking and screaming-not every day is easy in Autismville) and he would look at it. He would take the “active/current” activity from the top of this short list and pull the icon off the Velcro strip. Then he would “match” it on the “matching board” I had always available. You have to stay a few steps ahead with this method and it’s hard to get into this habit, but it’s very worthwhile. You’ll have to make sure you have plenty of icons available so that you can place the next activity on the matching board before they check their schedule again, and so on. In time, their schedule will grow and you may even implement a Choice board so that they can make more spontaneous requests. Now, I’m sure some of you are wondering doesn’t this teach my child that they don’t have to use verbal speech for communication? Will this prohibit their speech development further? I had the very same concerns. The way we handled this was to require our son to at least sign “please” & “more” at every opportunity. If he didn’t do it on his own, then we did this for him hand-over-hand. Once we progressed to a point where he was speaking single words, we would prompt him to say, please or more instead of simply signing. We worked very hard for words…once he was able to say please/more….then we pushed a little harder. He’d choose an icon representing choices for his snack (banana, cookie, toast) and I’d hold out on giving it to him until he said cookie in his best approximation. You’ve got to really ramp up the praise too! It was like a party in our house every time our little guy used words to communicate. We would clap and cheer and hug him, telling him how proud we were. Each and every time! This exuberant praise goes very far in motivating our children. Remember, before every major planned activity (which includes the normal day to day stuff like snacks, lunch, watching a DVD movie, etc.) you’ll take your child to the schedule first and allow them to pull that item off and match it on a card before beginning the activity. Follow this practice consistently and with everything and I hope you’ll find your window of communication begins to open. Now that my son is four, we plan his entire day each morning before he goes to school. The schedule gives him a sense of added security and helps to ease tantrums that may come from transitions. It can get quite long and we’re still working on rolling with unexpected changes (like visits from family/friends, sudden errands, teacher’s calling in sick, etc. ), but he’s learning and we’re able to accomplish more and more of this through spoken language every day. 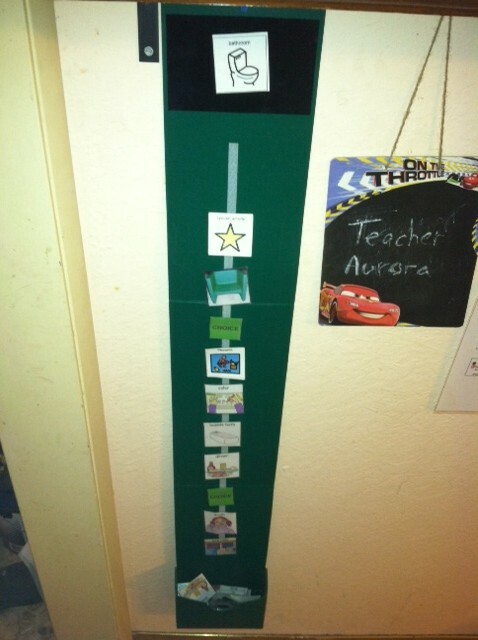 Many families also use some form of visual schedule when their outside the home as well. There are a few ways to do this and none are incorrect. Whether you simply print a quick schedule that lists your errands in order, or make a small board to take with you, it helps to alleviate their anxiety and stress surrounding not understanding what is coming or expected of them. We use an app on the iPhone called, First Then Visual Schedule. It is a great way to keep order while on the go & allows the same matching procedure by enabling the child to touch an icon resulting in a checkmark. help to explain the steps involved in various tasks visually. We keep them close at hand in the areas where they will be useful. For example, we’re still teaching our son how to wash his hands properly. There is a story strip in the bathroom we refer to daily when carrying out this routine function. We also use story strips for potty training. Often, it’s easier for visual learners to grasp the procedures when described pictorially. 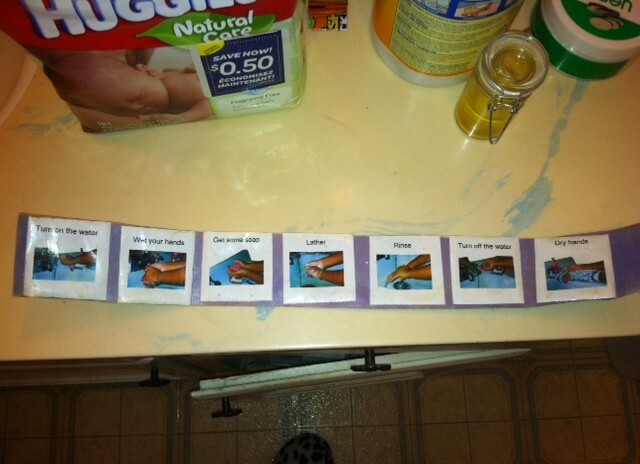 Here’s a story strip providing details on hand washing. 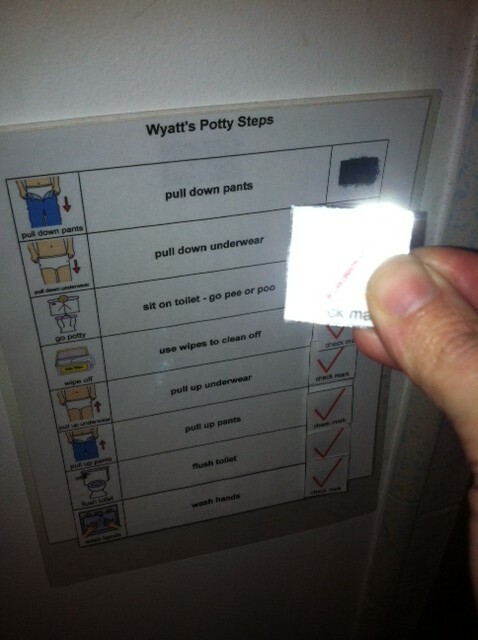 Here’s a checklist for potty training. (That’s a check mark I’m holding – sorry about the flash.) Our son used to place a check mark on his list as he completed each step. You can use visual aids to teach a wide range of things in your home. We have “House Rules” that shows the rules we abide by in our home. Some examples here include no biting, no yelling, no hitting, no kicking… We also offer “Better Choices” that our son can choose to reinforce positive behaviors. 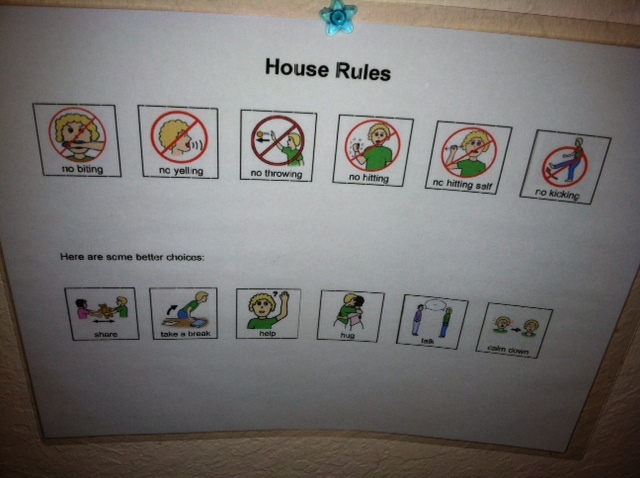 When my son breaks a house rule, I normally give him a warning at first, if he continues he’ll get a time out with a copy of the house rules to look over. Now, he can even point at the rule he broke and tell me the better choice he will take in the future. It’s not always such an eloquent conversation, but it’s an understandable version and I know I’m getting through to him with this. House rules that include better choices for positive behavioral reinforcement. I won’t go into social stories too much here, because that’s a whole series of discussion in itself. However, your PECS can help to develop this versatile tool for your Autism arsenal as well. I highly recommend reading about this subject from author Carol Gray. She’s the innovative one behind the development of social stories and provides in-depth information for developing your own effective stories to help your child. We rely on social stories heavily in our home and since my son responds very well to modern technology, I use a program called Pictello on iPhone. My son has a cheap iPod with the same software on it. I create stories on mine, then transfer them to his iPod. Every time we need to work on a specific behavior or teach him what to expect for an upcoming event (doctors visit, special blood test, getting a haircut, going to a birthday party, etc.) I create a story to help relieve any anxiety hem may be feeling. This helps us to avoid bad tantrums in public and helps to teach him more about good behavior in social settings. I can’t begin to tell you the difference that social stories have made in our life and there’s just about nothing I haven’t written one for at this point. Some of the more memorable titles include: Easy Pooping, Why We Shouldn’t Scream, Wyatt Gets a Haircut, Let’s Play and Share, Hooray for Halloween, What’s an Allergy?, etc. I’ve even published two social stories on Amazon.com for Kindle and will continue to do this as my chaotic life allows. I had a horrible time finding adaptable stories covering the death of a loved one and dreams/nightmares. Since I made one for my little guy, I thought I’d put it out there to hopefully help someone else. It’s just so very hard finding the time to accomplish these tasks. I hope that sharing some of this information is helpful. I’ll have more to share in the future – especially since I’m compiling a ton of old notes for a new friend living in Georgia. I wish you all the best on your journey – even if your child does not have Autism, many of these techniques can be useful for great teaching moments. Thank you for taking the time to do this with such great instruction.